Contrary to popular belief, food does not “soak up” or “absorb” alcohol but instead, slows it down by coating the lining of your stomach. Essentially it’s a pay me now or pay me later situation where alcohol is absorbed eventually. Foods that are high in protein such as meats and nuts are more effective in slowing the process. Seems to be common sense but you’d be surprised at how complicated it is. More alcohol in your drink = higher BAC. But, many drinks often exceed the “standard” amount of alcohol so long story short – 1 glass ≠ 1 drink. To get a periodic table version of alcohol content of most drinks click here. The quicker you put it in the faster the effects right? Well, it’s more complicated than that. Chugging beer, shots etc., does not get you drunk immediately because your body still needs time to absorb the alcohol but when it does hit you it hits you ALL at once = intoxicated faster. By putting large amounts of alcohol into your body at once you don’t allow your body a chance to get rid of anything so it’s all happening at once. But you knew that already didn’t you? Water pong anyone? The longer you spend drinking the more intoxicated you’ll be IF you don’t allow your body to eliminate the alcohol. Translation: If you pace yourself to about 1 drink per hour, theoretically speaking you should be able to keep your BAC relatively low – granted, if you drink for 10 hours, not so much. Point: What’s the rush? If a 160 lb. man drinks around 5 drinks in 1 hour his BAC ≈ .14. At an average elimination rate of .015, it would take him roughly 4 hours just to be at .08! It would take an additional 5 1/2 hours to get rid of all the rest of the alcohol in his system! Does this mean you should go run laps? No. Well, yes from a health stand point but if you’re intoxicated I’d still say no. Water does help keep you hydrated so switching out alcoholic drinks with water is a great idea but water does not cancel out alcohol thus does not act as sobering agent. The idea behind this is that a person with high tolerance looks less intoxicated thus is safer to drive. WRONG! First: Tolerance = Need for more to achieve original effect*. Translation: Drink more to feel the same effects as before. Problem: Just because you have learned how to manage the physical symptoms of intoxication (speech, walking, etc.) does not mean you are immune to how alcohol affects your higher level thinking – i.e. your judgement. Also, tolerance DOES NOT impact your BAC. Quite the contrary – if two men of equal height/weight drank 7 drinks in 1 hour – both would have a BAC of ≈ .20 BUT one may look less intoxicated because he has a higher tolerance. Think again – Research shows that driving ability can be impacted at BAC’s as low as .02 in which judgement is already being affected*. Men weighing around 140-150 lbs can easily reach .02 from 1 drink. 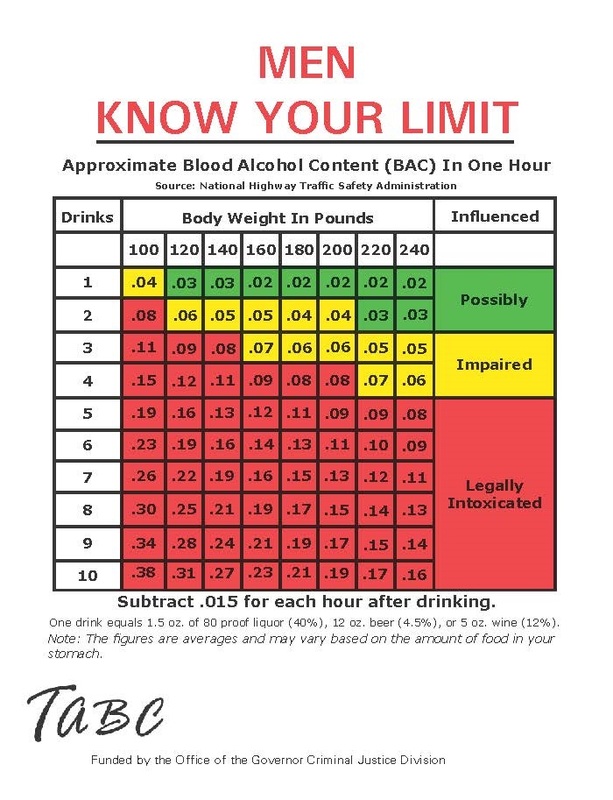 For women weighing 100-120 pounds, 1 standard drink can result in a BAC of .04-.05! Research has shown that BAC’s of .05 can impact a person’s eye muscle control and vision thus, their ability to drive. Don’t take a chance – always designated a DUDE. One of the big problems with telling if a person is intoxicated or not is that we always wait for visual cues like stumbling, slurring, dropping things etc., to decide if a person’s had too much. The problem is that research shows many people don’t start to show these visual cues until BAC’s past the legal limit of .08*! The safest way to tell is someone is past their limit is to count their drinks! Regardless of what a person may say, the number of drinks speaks for itself and you should never allow them to drive! Texas Alcoholic Beverage Commission (2012). Drinking Alcohol Comes with Responsibilities. Brick, J. & Erickson, C. (2009). Intoxication is not always visible: An unrecognized prevention challenge. Alcoholism: Clinical and Experimental Research, 33 (9), 1489- 1507.